This festival while very interesting and colorful has been less known to most visitors. An interesting introduction into the main valleys of Bhutan with an experience of a Buddhist festival that is key to understanding Bhutanese culture. It re-enacts the interesting period of the Tibetan invasion of Bhutan with the riding of the war generals in full battle armour as they ride out of the Dzong courtyards- in protection of the famous relic that was brought from Tibet; this is then followed by the Buddhist mask dances in the cobbled courtyards. Day 1: DEL/KTM - PBH: by druk air kb 103 dep del 1245, ktm 1435 arr 1445. meet bhutan yod sel representative at airport. transfer to your hotel. 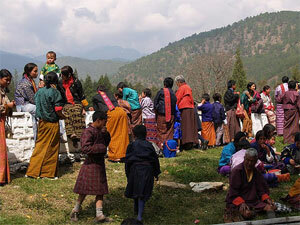 Day 3 WED: PARO/THIMPHU: drive by the two river valleys to the capital city of thimphu. after lunch visit to the hospital for traditional medicine, memorial chorten and the national library. after lunch visit the handicrafts center & the school of thanka painting. overnight at hotel. Day 4: THIMPHU/PUNAKHA: scenic drive on the mountain route towards the former capital of bhutan passing through the dochu la pass (alt. 10,000 feet); beautiful scenery of himalayan ranges. descend to punakha & wangdi valley. overnight at hotel. Day 7: BUMTHANG/PUNAKHA. return drive to punakha after viewing village weavers. hotel. Day 11: PARO- DEL/KTM: transfer to paro airport for morning flight on druk air end of services.